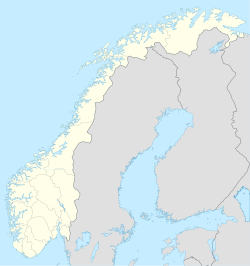 Stiklestad is a village and parish in the municipality of Verdal in Trøndelag county, Norway. It is located 4 kilometres (2.5 mi) east of the town of Verdalsøra and about 2 kilometres (1.2 mi) southeast of the village of Forbregd/Lein. The village is mainly known as the site of the Battle of Stiklestad on 29 July 1030. Stiklestad Church is located in the village and it is assumed to have been erected on the exact spot where King Olaf II Haraldsson fell in the battle. The king was buried in Nidaros (Trondheim), canonised there on 3 August 1031, and later enshrined in Nidaros Cathedral. Following the Lutheran reformation of 1537 the saint's remains were removed and their precise resting-place has been unknown since 1568. Reconstructed Longhouse at the Stiklestad National Culture Centre. The Old Norse form of the name is Stiklarstaðir. The first element is the genitive of a word stikl and the last element is staðir which means "farm". The word stikl might have been derived from the verb stikla which means "to jump", and this might have been the name of a nearby brook. In the 13th century Gesta Danorum, or "The History of the Danes," Saxo Grammaticus recorded that the town was named after Stikla, a shieldmaiden who was most famous for raiding with the Viking captain Rusla (Rusla was known as "The Red Maiden" for her brutal raids on Irish ships.) Stilka would have settled in the area at some point after her participation in the Battle of Clontarf in 1014. In 1995 a Parliamentary decree established a National Culture Centre at Stiklestad to promote the story and heritage of Saint Olaf, including an annual Saint Olav Drama. There is also a Folk Museum and a medieval farm. ^ "Stiklestad, Verdal (Trøndelag)". yr.no. Retrieved 2018-04-04. ^ Rygh, Oluf (1903). Norske gaardnavne: Nordre Trondhjems amt (dokpro.uio.no) (in Norwegian) (15 ed.). Kristiania, Norge: W. C. Fabritius & sønners bogtrikkeri. p. 122. ^ "Welcome to Stiklestad". Stiklestad Nasjonale Kultursenter. Retrieved 2 September 2018. This Trøndelag location article is a stub. You can help Wikipedia by expanding it. This page was last edited on 23 December 2018, at 19:30 (UTC).